Sistema Sem Fio Shure GLXD24/BETA58. Assento: Molded ABS. Electrónica: Alcance: 60m. Padrão Polar: Supercardioide. Dinâmico. Carga: 147 dB SPL. Sensibilidade: -88 dBm, typical. Comprimento: Receptor: 18.3 cm; Microfone: Diâmetro 5.1 cm. Altura: Receptor: 4cm; Microfone: 25.2 cm. 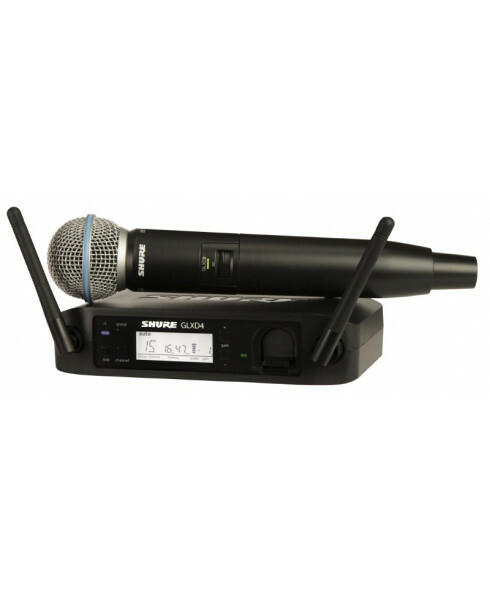 Includes GLXD4 receiver, GLX2/BETA58 handheld transmitter, microphone clip, power supply, rechargeable battery, USB cable, carrying case, and user guide.